It was sometime in January of 1970. I was a student at the University of Washington, Seattle, pursuing a master's degree in electrical engineering. The intense love for art that accompanied me from India was looking for the right opportunity to explore. 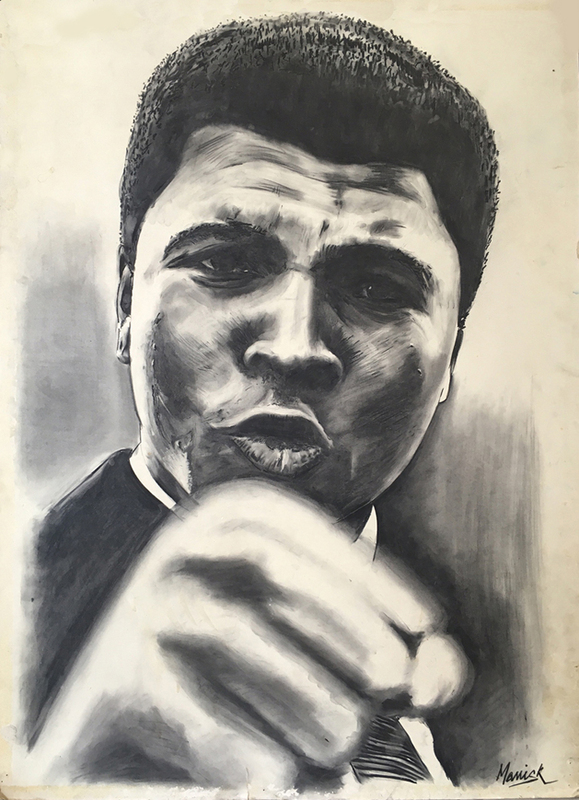 Fascinated with one of the posters of boxing legend Muhammad Ali, I wanted to draw his portrait in black and white with charcoal on a white illustration board. I remember, it took me a painstaking seven to eight hours to complete the 30" x 40" charcoal portrait. For sharp lines and edges I used the darkest part of the charcoals and for shades, I rolled up newspaper pieces and dipped into selected portion of ashes to be used as shading brushes. When my American roommate came from his classes at the university and saw the portrait, he was impressed as much as he was in shock. "Fireplace? This is the first charcoal portrait I have seen made with real ashes from a wood-burning fireplace ". After a pause he said, "Manick, 'Charcoal Pencils' are readily available for purchase from art stores in the U.S.; you should've just told me!!" That day I learned something new. The portrait made with fireplace-waste was one of my favorites. Despite many handsome offers, I did not sell it. As the news of Muhammad Ali's demise on June 3, 2016 flashed across the country, it brought back memories and the portrait came alive with a special meaning. I dedicate the unique labor of love to the Great Legend. Muhammad Ali is no more; long live Muhammad Ali.